Click Here to get this presentation. ​Deep, Meaningful, and Engaging technology integration is not synonymous with latest and greatest tool. Find the tool that your teachers can use easily and help teachers innovate with it. How did we create true technology integration through the innovative approach of using something old. Click Here to get this presenation. ​Google Keep has many features to help you and your team stay organized. From a great shopping list to a project management storehouse. It is where I take notes, keep track of tasks, and help my students plan their projects. Come and learn about this simple little tool. During the 2017-2018 school year we built 8 Innovation labs in Capistrano Unified School district. What did they look like, how did we support them, and how did we get the schools to own their innovation labs. Come and learn about our journey. ​What do you do when you have a chromebook cart? Having been a part of a 25,000 chromebook rollout, I have gained experience and some helpful hints to get you up and running with chromebooks in your classroom. Most teachers spend a majority of their time lesson planning in google drive and classroom. In this session, we will take a dive into some of the google products that you may not know exist. How can these tools redefine your classroom. Click Here to join this presentation. ​This is a collaborative presentation where we work as a group to curate amazing lesson ideas that change education. We have gotten rid of the S and are ready to drop the AMR (of SAMR) on our students. Screencasts are computer screen recordings. What can students feed screencasts? Through this session we will look at several tools and how they can be used in the classroom with Screencastify to engage students in creating presentations and explanations where they describe the “how” and “why” of the project. Not just the “what.” Screencastify is a great way to get students communicating, collaborating, and thinking critically. Most importantly, students will be creating. Come and play. When students were working, what did they do? Could students have completed the assignment without technology. Is the technology activity and enhancement or a transformation of an old activity? 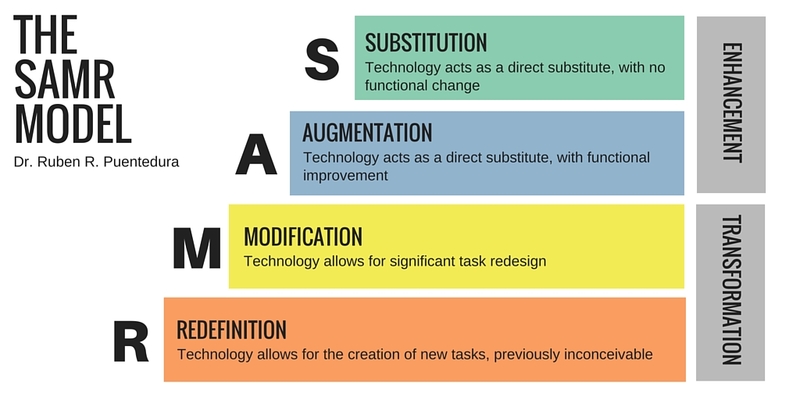 The SAMR model is a great way to reflect on the implemented lessons/activities and the affect of using technology in the activity. Video with more. I tend to think of SAMR like a swimming pool. The technology should match the learning goal. Just make sure that your learning goal includes an extension. If technology allows students to learn more in depth and create, then learning activities should ask students the "Now what? ", "How can you apply this? ", and "What can you create with this?" ​Great teachers match learning objectives with the appropriate pedagogy to come up with lessons and activities that engage students in critical thinking, collaboration, communication, and creativity. TPACK is a design tool that reminds teachers to incorporate Technology (T) with interactive and effective Pedagogy (P), and (A), Content Knowledge (CK) to create learning activities. Not every activity should use technology, but the question of whether or not to use technology should always be a consideration. Combine this design process with constant reflection to ask what can we add to the lesson or what can the students do to learn or create more throughout the activity.